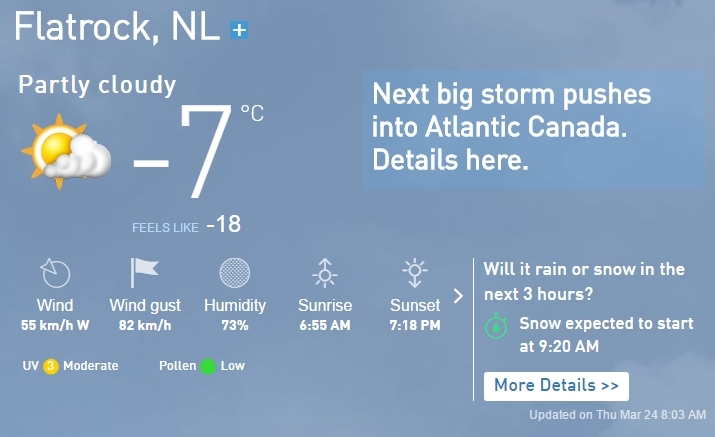 Newfoundland weather report for March 24th, 2016. It’s been like this for most of March. Translation for Americans: -18°C = 0°F; 82km/h = 51mph. And most of you probably know what snow is. This entry was posted in Month of March, Weather, Year 2016. Bookmark the permalink. Ugh, that’s cold. I used to fly into Gander a lot, and it seemed frigid even in the summer. Of course, I was living in Miami at the time, so maybe it was just cold by comparison, but zero — that’s cold no matter where you live! Fingers crossed that your girls stay cozy until spring! Newfoundland beekeepers have more in common with Icelandic beekeepers than anyone else, though at this moment it’s 5°C in Reykjavik and -6°C (-18°C windchill) in St. John’s.